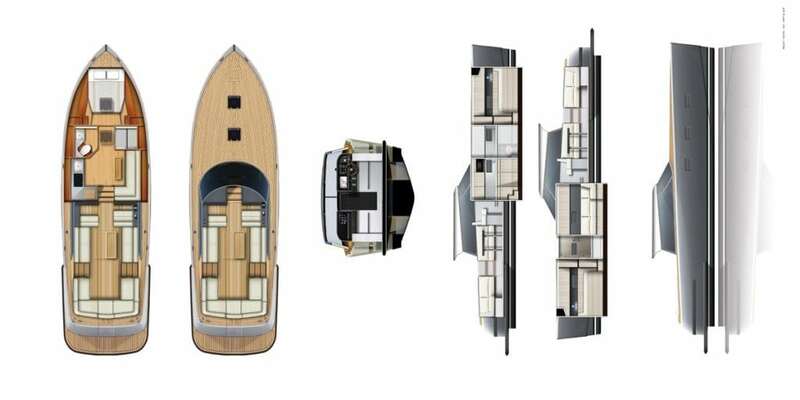 The Reliant Yachts X40 (40′ 4″ LOA, 12′ 6″ beam) is a modern interpretation of the Downeast style, and her sharp angles and plumb bow will stand out from the crowd whether in Newport, Miami or the French Riviera. Jim Ewing and partner David MacFarlane have long been known for their involvement in two of yachting’s classic names, Trumpy and Alden. The X40 cockpit can accommodate up to 10 guests and has a walk-through transom door to the swim platform. The galley is below-decks and to port, with a two-burner stove, refrigerator, microwave, and plenty of storage. Across from the galley to starboard is a sitting area that converts to a guest berth. Forward to starboard is the head with a large separate shower, and the queen master is forward.